Brightwell Aquatics Zooplanktōs-M is a concentrated suspension of copepods, a group of zooplankton heavily preyed upon by various aquatic organisms because of their size. The specific variety of copepods present in Zooplanktōs-M are extremely rich in amino acids, omega-3 fatty acids, vitamins, and numerous carotenoid pigments, making them of exceptional nutritional value to the organisms that they are consumed by. These copepods fall within the mesoplankton (200.0 - 2,000.0µm) class of plankton. They are the proper size for feeding many species of stony corals (large- and small-polyp), as well as clams and other bivalves, plumed worms (Christmas tree worms, feather dusters, etc. ), larval crustaceans and bivalves, juvenile fishes, and the adults of planktivorous fishes (such as anthias, basslets, pseudochromids, dartfishes, chromis, etc.) and microinvertebrate-predators (such as mandarinfishes, some gobies, dwarf wrasses, etc.). 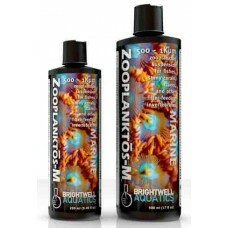 Zooplanktōs-M, particularly to corals and their allies that have recently undergone fragmenting or propagation. Zooplanktōs-M may be used in conjunction with other planktonic suspensions to provide a complete range of sizes to filter-feeding and planktivorous organisms. Zooplanktōs-M does not require refrigeration; however storage in a cool, shaded area will prolong the activity of the vitamins. Refrigeration will maximize the shelf-life of the product. Planktonic food suspensions (such as this one) are best utilized by target feeding specific invertebrates in an aquarium; in doing so, the majority of the food may be consumed by the intended organisms rather than ending up in filtration media or indirectly impacting water quality (as often occurs when indiscriminately “broadcast feeding” by adding liquid food suspensions to a stream of water and allowing the contents to disperse randomly throughout the aquarium system).